About 120 metres up the track from Brasenose Place on the Redwood Bush track is a junction. Continue uphill, across a small style about 150 metres further up (at this point there is also a well formed track that follows the bush-line right - see Bosun Terrace. It parallels the Redwood Bush track but higher up the hill, and is for pest management (ie possum trapping). 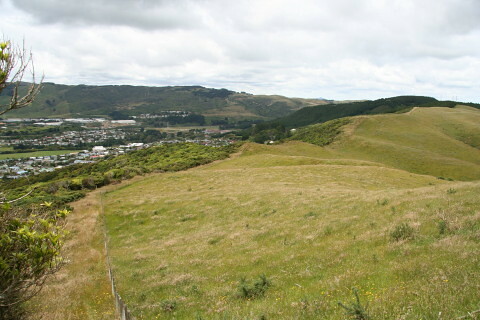 If you continue up-hill you rise above the bushline and follow the fenceline around to the right with good views over Tawa and Churton Park. The track climbs uphill to the pine plantation, and through the forest to the top of the hill. The airstrip is on private land on the other side of the fence to the left. As you emerge from the forest there is a gate at the top of the hill, and about 50 metres past the gate is a small geodetic survey marker on the hill, which is shown by the short track leading to a dead end. You can continue downhill and join up with the Spicer Forest track. There is well formed route. From the gate at the top of the hill, the easiest way is to cross the fence and follow the fence-line on the right down past the pine plantation. There is another fence to cross, and continue following the fenceline beside the pine plantation until your reach the more mature Spicer Forest. There are two white signs (relating to possum poison) on the fence. When you cross this fence you will see the well formed track heading through the pine trees, which joins up with the main Spicer Forest track. NOTE that access to Spicer Forest is currently closed to the public - see notes on Spicer Forest track page. Track from Redwood Bush at the end of Brasenose Place in Tawa. This track used primarily by possum trappers and is not properly marked so I recommend taking your GPS the first time you attempt it.